In his latest review, Ceasefire's opera critic, Paul Guest, gives his verdict on a production of Simon Boccanegra at the English National Opera. Bruno Caproni, Rena Harms, Peter Auty, Brindley Sherratt, Roland Wood. Last season we were graced with a stunning production and concert performance of Simon Boccanegra, with Placido Domingo and the Royal Opera, conducted by Antonio Pappano. It was now the turn of the English National Opera and their music director, Edward Gardner, to shine their light on the august work. Unfortunately, I saw no such light in this production (directed by Russian director Dmitri Tcherniakov). It opened with some textual commentary projected on to the stage in order to set the scene, the curtain rises and a detailed set is revealed of the street outside the home of Fiesco- this is where the movement first becomes static. The Grimaldi household set is, again, dull with its white big wall, although there is a clever transition between the first set and this one. The set for the rest of the opera, supposedly “the palace”, seems instead more like a modern classroom complete with its own whiteboard. Chairs get thrown around and Rena Harms as Amelia Boccanegra has some unconvincing breakdowns in her gothic teenage character, in fact they were so unconvincing I almost chuckled: This is the extent of the drama; the rest of the opera remains pretty still. This was most certainly a bold adaptation in a modern setting but one that didn’t work for me. However where this production succeeded was in the pit; Edward Gardner brought out the best from the orchestra and, musically, the production was incredibly strong. The orchestra were vibrant, exuberant and exciting in their playing of this great Verdi score. The Chorus too assumed a very strong vocal stance, bold and powerful. Bruno Caproni sang the title role with great vocal clarity and colour; he gave us dark, mighty and passionate. He was dramatically passionate throughout; his poignant death scene at the end of Act iii was a highlight both vocally and dramatically especially with his paper hat. Brindley Sherratt is outstanding as Fiesco – vocally supreme. 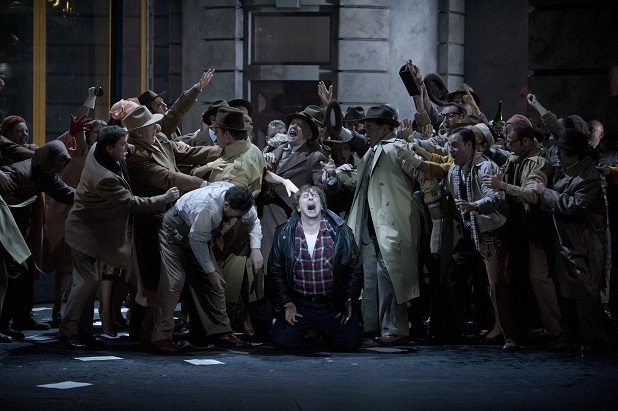 Peter Auty too sings a colourful Gabrile Adorno in his biker outfit – though I am still baffled as to why he wore a biker outfit throughout the production. Rena Harms didn’t impress as Amelia Boccanegra, dramatically hideous and vocally she is wobbly – she just had the wrong colour and the wrong texture in her voice to sing this role; with a loose vibrato and unfriendly tone she was less than convincing as Boccanegra’s daughter. The production was boring and the staging was still. There was some vocal supremacy from the cast but, overall, the score, orchestra and conductor rein this production in.